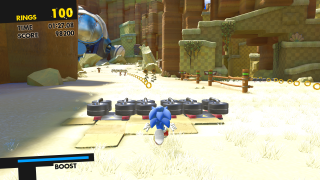 Lost Valley is the first stage of Sonic Forces, which is located in the greater location based on Green Hill Zone from Sonic the Hedgehog, but with greater influence from the version seen in Sonic Generations. This is also the first stage played as Modern Sonic. Plot-wise, Sonic boosts through this region after receiving a distress call from Tails in the city, and discovers that the dazzling landscapes of these tropical hills were destroyed by the industrialization imposed by Dr. Eggman, the landscape now turned into a larger desert with dead and dry vegetation, with giant sandworms from Sonic Lost World's Desert Ruins swimming about in the background. The stage is relatively short, and is filled with Hint Rings that explain how to play as Sonic. Lost Valley begins with a long linear road until the player gets White Wisps to be able to boost and destroy the enemies ahead. After passing through a bridge with a Homing Attack chain and through springs, the player arrives to a 2.5D section with some small alternative straight paths, where it is necessary to jump on swinging platforms to reach the best possible path. Then, Sonic goes through a S-tunnel and falls in a sand cascade to the final section, divided into two linear paths, one in which the player passes through a circular bridge and another in which they pass through a sand waterfall, both leading to the end of the stage. This page was last edited on 4 April 2018, at 23:44.